Residents of the Salinas Valley will soon see their utility or water bills go up – but only a little. The new fee, which is likely to be passed by July 1, will add about $2.27 for non-agricultural residents, and $4.81 per irrigated acre for agricultural users. The fee is needed to fund the valley’s newest water agency — the Salinas Valley Basin Groundwater Sustainability Agency. If the new fee schedule passes, residents in areas managed by the new GSA can expect to likely see the fee included in their property tax bill or their water utility bill by the end of the year. The agency was created in 2017, as was mandated by California’s Sustainable Groundwater Management Act (SGMA – pronounced sig-ma) of 2014. The law is completely rewriting how groundwater is managed in the state, mainly because until now, it was barely managed at all. But many areas of California rely on underground aquifers as their main source of water, referred to as groundwater. This is particularly true for Salinas Valley and the entire Monterey region. “If you have irrigated crops, or if you have water to your house, you are almost certainly using groundwater,” says Salinas Valley Basin Groundwater Sustainability Agency General Manager Gary Petersen. 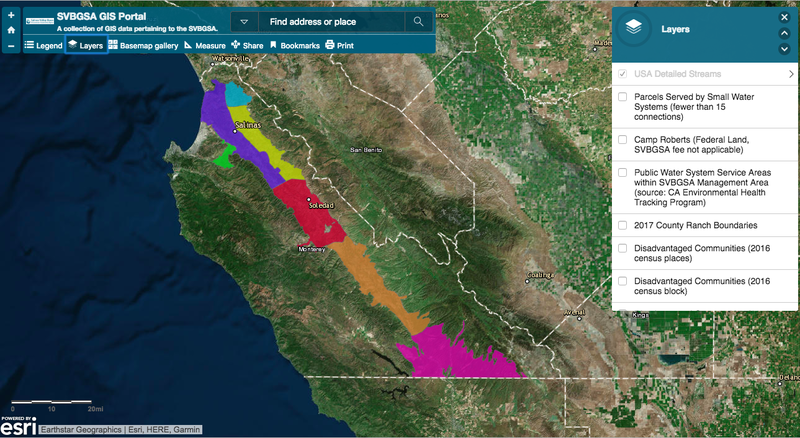 In the Salinas Valley, of the six aquifers currently managed by the sustainability agency, five are overdrafted. One, the 180/400 aquifer (the cryptic-sounding name refers to the depths below ground), which sits just underneath the City of Salinas itself, is listed as “critically overdrafted”. Salinas Valley water systems map from the Salinas Valley Basin Groundwater Sustainability Agency website. Under SGMA, the state mandated the creation of the Salinas Valley Basin Groundwater Sustainability Agency. SGMA also states that the new agency must put in place a plan to manage the area’s critically overdrafted groundwater by Jan. 31, 2020 – just over a year away. That deadline is coming up quickly, but before the agency can do anything, it needs money to function. That is the looming threat of SGMA – if local agencies fail, the state will take over and impose a much steeper fee. While the proposed fee will cost residents a little over $2 per well connection, the state will likely charge $300 per well, plus $40 per acre foot of water that is pumped up. If you’re watering crops, the state’s cost could be just as prohibitive. According to calculations put together by Hansford Economic Consulting, a consultant hired by the agency to study how they should implement a fee, agricultural groundwater users would pay up to $110 per acre of irrigated farm land, compared to just $4.80 under the local agency – a difference of almost 2,200 percent. That money will be used only to fund the agency, says Catherine Hansford, the owner and principle of Hansford Economic Consulting. It will not be used to fund any “capital or infrastructure projects.” Because this is a fee, and not a tax, it does not have to be voted on. Instead, Hansford says that she held a series of workshops and brought together people from agriculture and private and public water providers in the area to work out a few different ways that a fee could work. Then, in October, the sustainability agency board voted to move forward with the plan to charge agricultural users $4.81 per irrigated acre and non-agricultural users $2.27 annually. Because agricultural water-user fees are calculated per acre, they will end up paying for about 90 percent of the agency’s annual cost. This 90-10 split between ag and non-ag water use reflects how water is used in the valley, says Hansford. Although the 11-member board is made up of many different interests — including a group of four who represent agriculture — the proposed fee seems likely to pass, either at the February board meeting or, if substantial changes are needed, in March. That’s well before the state’s July deadline. Janet Brennan, the board member who represents the environment, says that the real challenges will be in the near future, when the agency tackles issues like seawater intrusion and ecosystem needs. The board also includes several names familiar to Salinas Valley politics, including Lou Calcagno, a dairy farmer from Moss Landing and former Monterey County supervisor, current Monterey County Supervisor Luis Alejo and Salinas Mayor Joe Gunter. Editor’s note: The original version of this story has been corrected to reflect that the agency must be funded by July 2019. Ian Evans is a freelance environmental journalist who grew up in California and writes about the complex relationships between water, land and policy.